The Secretary General of the Polisario, Mohamed Abdelaziz passed away Tuesday afternoon at the age of 69 of lung cancer, it was officially announced in the Tindouf camps in south-western Algeria. Mohamed Abdelaziz, a native of the Moroccan city of Marrakech, has been maintained for forty years at the head of the Sahrawi separatist front thanks to the blessing of the Algerian military oligarchy and the Algerian regime. Abdelaziz is the son of Khelili Rguibi Mohamed Salem, a retired soldier of the Moroccan army, who never left his native Morocco, where he lives with the rest of his family. 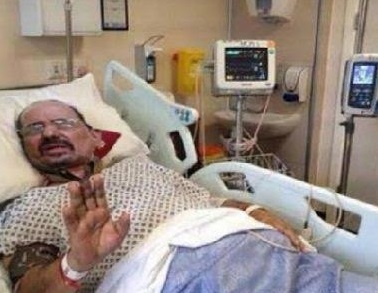 The successor to Mohamed Abdelaziz should be designated in forty days. Meanwhile, the President of the pseudo National Council, Khatri Addouh, is assuming the role of acting leader of the front. The succession war will not take place as suggested by some media, said a Western diplomat accredited in Algiers. The diplomat believes that this issue will be settled in closed sessions in Algiers and not in the Polisario headquarters in Rabouni camp, in Tindouf. The diplomat said that major decisions concerning the management of the Tindouf camps, the Polisario’s foreign policy and its future, were always part of the prerogatives of the Algerian military oligarchy and particularly its intelligence and security department (DRS) in consultation with some hawks of the regime that are openly hostile to normalization with neighboring Morocco. For the diplomat, connoisseur of the mysteries of the Algerian regime, the Algerian generals would choose Mohamed Lamine Bouhali, former defense minister of the so-called SADR and a former officer of the Algerian army. This choice is explained by the fact that Bouhali has always sided with the front’s radical bloc, favoring the resumption of weapons against Morocco in the dispute over Western Sahara. In contrast, civilian leaders close to President Bouteflika, who are opposed to an armed confrontation at their country’s borders, would rather opt for Abdelkader Taleb Omar, a native of the Moroccan town of Tan Tan, who has been holding the position of “Prime Minister” since October 2003. Taleb Omar has always heeded the guidelines and instructions of the Algerian Presidential palace and would thus provide more guarantees that there would be no change at the level of the Polisario leadership. The Algerian regime wants to avoid at all costs an armed conflict with Morocco but at the same time it does everything to perpetuate the Sahara conflict to weaken its Moroccan neighbor and to ultimately impose its leadership in the sub-region, a dream dating back to the cold war era.